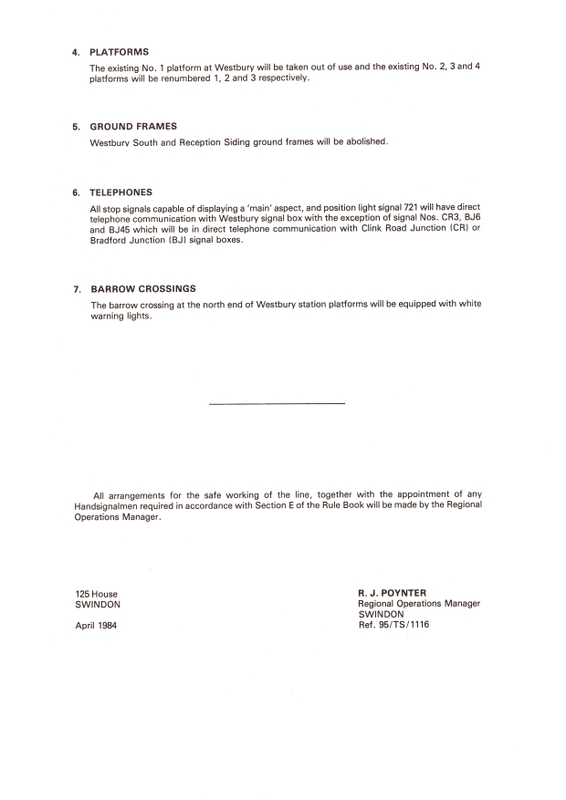 Description: New signal box at Westbury and closure of Heywood Road Junction, Fairwood Junction, Hawkeridge, Westbury (formerly Westbury North) Signal Boxes. 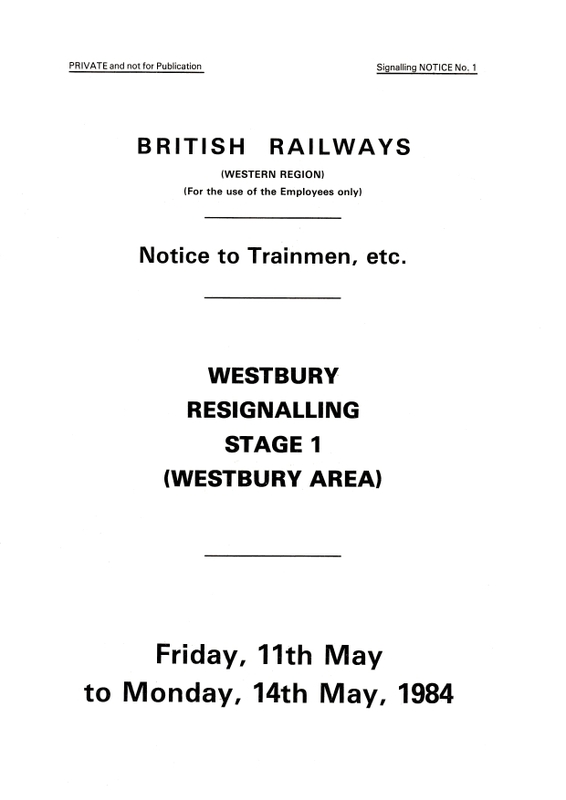 W102, 305, 699, 702, 704, 707 recontrolled to new Westbury. W205 renumbered to W207 and recontrolled to new Westbury. W651 renumbered to W751 and recontrolled to new Westbury. W653 renumbered to W753 and recontrolled to new Westbury. 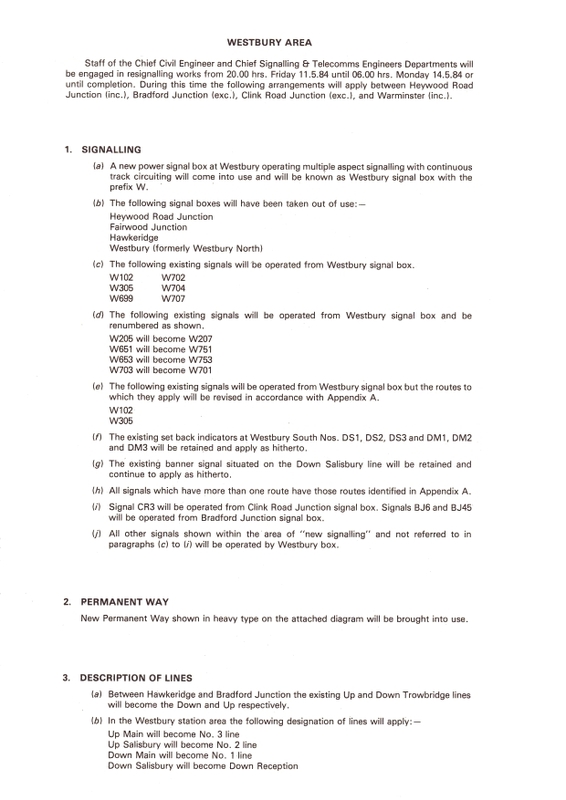 W703 renumbered to W701 and recontrolled to new Westbury. W102 and W305 recontrolled to new Westbury and routes altered. Set back indicators at Westbury South, DS1, DS2, DS3, DM1, DM2 and DM3 all retained. Between Hawkeridge and Bradford Junction the existing Up & Down Trowbridge lines becomes the Down and Up respectively. The Up Main at Westbury Station becomes the No 3 Line. The Up Salisbury at Westbury Station becomes the No 2 Line. The Down Main at Westbury Station becomes the No 1 Line. The Down Salisbury at Westbury Station becomes the Down Reception. Existing platform 1 at Westbury Station taken out of use and existing platforms 2, 3 and 4 renumbered 1, 2 and 3 respectively. Westbury South and Reception Siding Ground Frames abolished. Barrow Crossing at Westbury station equipped with white lights.